フランス理解講座：参加者募集！ French seminar: Looking for participants! Alice from Kyoto Prefectural International Center here! I will be doing a French seminar in November about the area where I was born, the Gironde department (located in the South West of France). 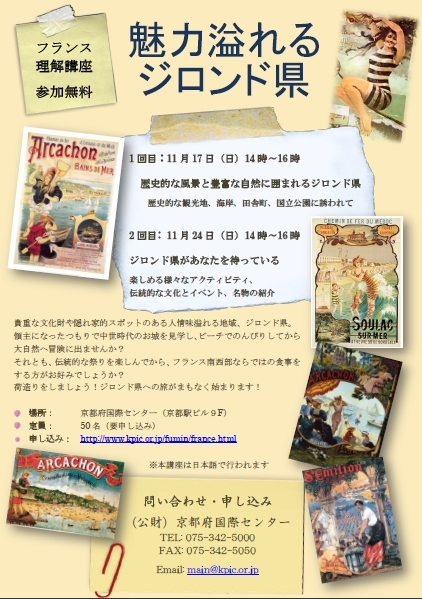 The seminar will be held in Japanese, and entrance is free. Steven from Seika here. Once again, I’ll be talking about my lectures on America. The fourth talk in the series was on Thursday, October 3rd at the Seika Town Office. This lecture’s theme was on America’s congressional election system. Coincidentally, the lecture took place just a few days after gridlock in Congress caused a partial shutdown of the United States government, providing a convenient way to incorporate the discussion into the framework of current events. America’s current legislative system was established in 1787 during the drafting of the country’s constitution. The American Congress is divided into the Senate, in which each state gets equal representation, and the House of Representatives, in which states are allotted representatives based on population. This split came about due to a compromise between small states and large states; the Senate appeased the small states by giving them the same power as the large states, and the House of Representatives satisfied the large states by giving them an advantage. Senate terms last six years, while House terms are two. Senators are elected from states, while representatives are elected from districts within states; unlike Japan, there is no system of proportional representation. All elections for Congress take place in even-numbered years. The 100 seats of the Senate (two for each of the 50 states) are divided into three classes. The classes are staggered so that one year there will be 33 seats up for election, then two years later 33 more seats, then finally the remaining 34 seats two years after that. For instance, Senate seats designated as Class I were up for election in 2000, 2006, and 2012, while Class II seats were up in 2002 and 2008 and will be up again next year. 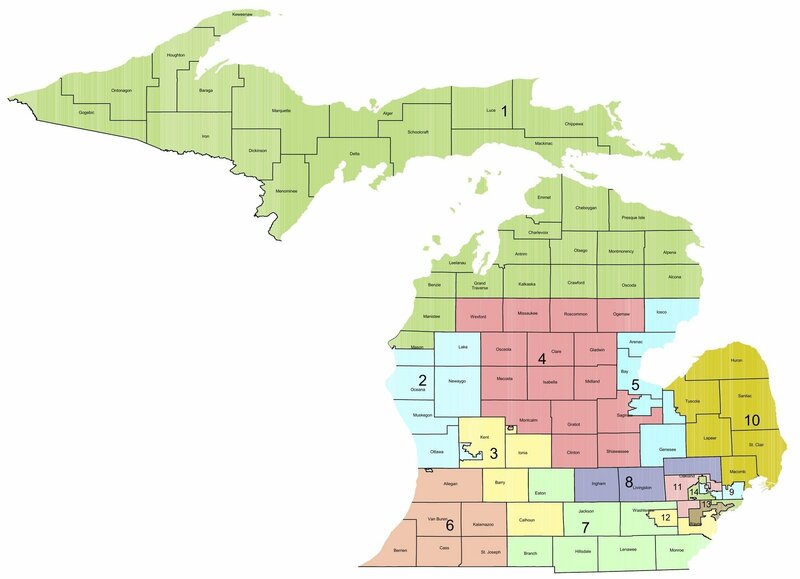 With the exception of special elections (which take place when a senator leaves office due to death, resignation, or other reason), no state ever has both of its Senate seats up for election at the same time. The House of Representatives is made up of 435 legislators. Each state is assigned a number of districts based on its population as of the most recent census, and each district elects one representative. Currently, California has the greatest number of seats at 53, while seven states have the minimum of one seat (i.e. representatives are elected statewide). The census is taken every ten years; states that have grown faster than the nation at large may gain seats, while states that have grown more slowly or lost people may lose them. After the census, each state draws its own districts so that they have an equal number of people. The reason why gerrymandering is an issue right now is that, according to its detractors, it distorts the ability of elections to accurately reflect democratic will. For instance, last year in the state of Pennsylvania, the Democratic Party won a majority of the overall popular vote for the House of Representatives in the state. However, the Republican Party, the other major party in American politics, won 13 of the state’s 18 seats. 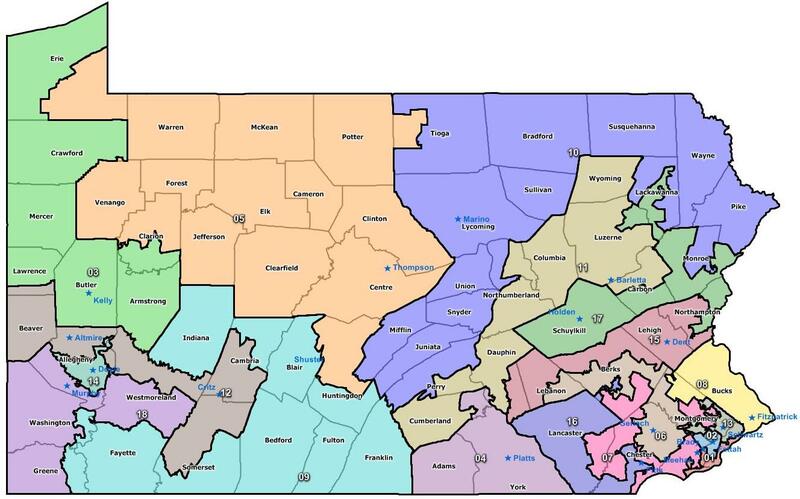 Democrats alleged that this discrepancy occurred due to gerrymandering by Pennsylvania’s Republican-led state government. Although I felt that the subject matter was very complicated and difficult even for Americans, lecture participants followed along very well. It was quite impressive how quickly they understood, given the numerous differences between the American and Japanese systems. I am looking forward to the next lecture, which will be held on Thursday, December 5th. That lecture will focus on interesting facts about all 50 states in the U.S. See you there! Alice from Kyoto Prefectural International Center here! On September 28th, I went to Kizugawa’s exchange hall to introduce France. This time, the audience was mainly composed of elderly people, so I prepared something fun to learn while playing. I created a Bingo game with a theme associated to each number. Therefore, when a number came out, participants filled their bingo grid and listened to my explanations about the associated theme. Many numbers came out so I had time to explain about French speaking countries in the world, French dishes, desserts and cuisine culture, yearly events such as Christmas, world heritage sites in Bordeaux, education and medical systems, the particularities of French people (gesture, personality, ways of working), the state of marriage in France etc. I like to call the image that Japanese people have of France a “VIP image”. Often, France is only associated with luxury brands (Vuitton, Chanel etc), Paris, high-end cuisine and haute couture. People do not know about the daily lives of French people, the events going on during the year, the food we eat at home or how our schools work for example. For example, did you hear about “Chandeleur” or “la galette des rois”? The first one is a crepe day in February, when everybody is cooking crepes at home. The second one is celebrated in January, and people eat a special cake called a “galette”, hoping to find the lucky charm hidden in the cake to become the “king” or “queen” for the day. Many people were also surprised to know that contrary to Japan, specialist schools are more valued than universities, and that public university costs “only” 300 euros a year. They were also startled to know that less people are getting married but still start a family under a special marriage contract called “PACS”, which is looser than actual marriage, and that people usually live together for years before getting married. It was also really fun to teach them the gestures we use in everyday conversation and how French people like to complain about everything just for the sake of it (but it doesn’t always mean we are unhappy about everything!). 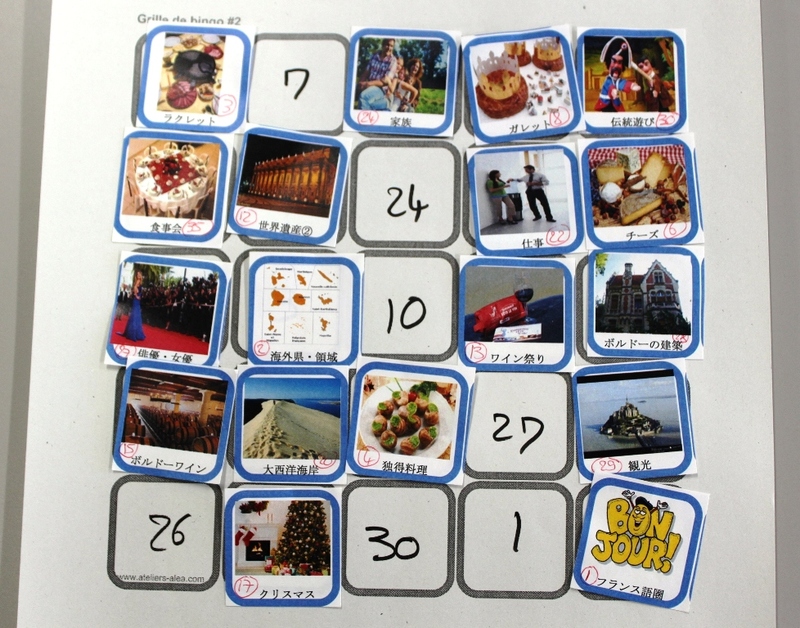 Participants sounded happy to learn a lot of casual and fun facts about France while playing Bingo, and I hope I will have the chance to introduce France to many other areas and people of Kyoto Prefecture.